Fans of the Toronto Argos and the Hamilton Ti Cats might have something to say about that as they put their friendly rivalry to good work in a recent Labour Day Rematch fund raising event. With a tailgate party to remember, one Ti Cat fan said farewell to one of his great loves, while an Argos charity made great gains. 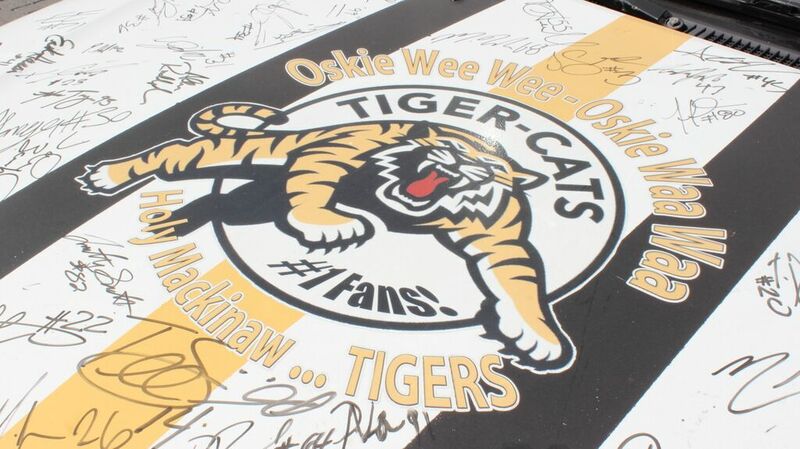 “Tiger-Cats fan Terry Cabral has spent the last four years collecting signatures of Ticats players and coaches on (his 1990 Toyota Corolla), which has been turned into a mobile shrine to the Black and Gold. Cabral adorned the car with a Tiger-Cats logo on the hood, along with black and gold racing stripes, a miniature CFL field on the trunk, and Hamilton’s famous ‘Eat ‘em Raw’ slogan. 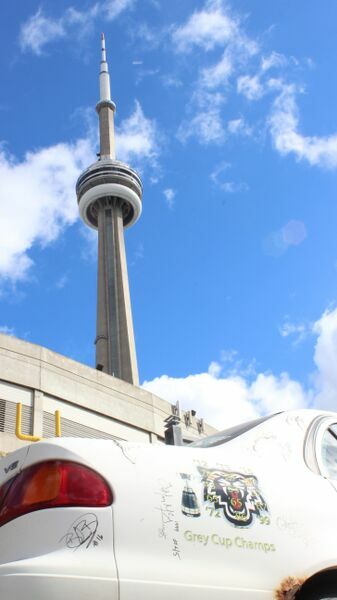 Upon purchase of the Toyota (from a reluctant Mr. Cabral), the Toronto Argos set their plans for an epic tailgate party fundraiser in place: for a $5.00 donation to the Canadian Safe School Network, fans had the opportunity to paint the car “Double Blue”, claiming it for their home team! That little Toyota ended up making a big impact for charity! 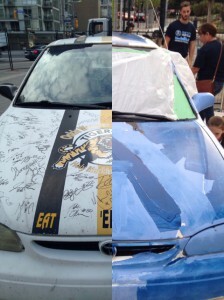 Not only did Mr. Cabral’s original sale of the vehicle benefit his own hospice charity, but the event at the Labour Day Rematch in Toronto brought in over $200.00 to the CSSN from paint-wielding fans. 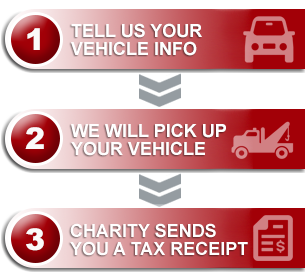 With the make-over complete, the Corolla was picked up for recycling by our Donate a Car Canada program, resulting in an additional $100.00 to the Canada Safe School Network. To all the fans and and donors alike, here’s to generous cooperation on and off the field as we work together to keep Canada giving generously!